Thinking lightweight? Great! Lightweight RVs – those weighing less than 8,000 lbs. – have earned incredible popularity in the camping world. Constructed of lighter weight materials than traditional RVs, most lightweight RVs don’t require a heavy-duty towing vehicle to get to their destination. In addition, they’re more fuel efficient than their heavier, traditional RV counterparts. If you have your sights set on a lightweight RV, you’ve probably done your research and asked plenty of questions. True, many questions about lightweight RVs also apply to traditional models. 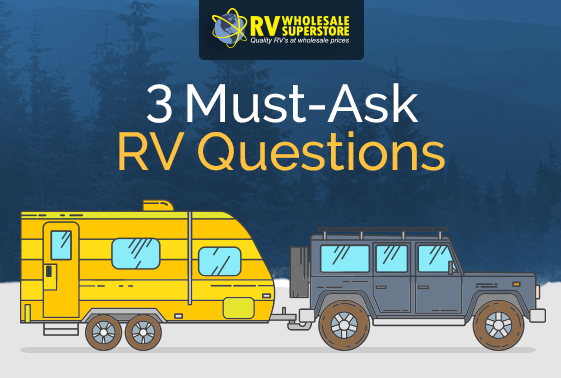 But because of the unique construction of lightweight RVs, there are 3 important, questions you must to ask the seller. Question #1: How much does the RV weigh? This question isn’t as cut-and-dry as it sounds. There are actually several answers, and each one is critical to the operation of your lightweight RV and the wear and tear on your towing vehicle. Dry Weight (DW), or Unloaded Vehicle Weight (UVW), is the weight of the RV as built at the factory. The UVW does not include passengers, cargo, dealer-installed options, personal belongings, water, or LP gas. Gross Trailer Weight (GTW) is the actual weight of the fully-loaded trailer including all options, cargo, personal belongings, food, water and LP gas. Gross Vehicle Weight Rating (GVWR) is the maximum permissible weight of the vehicle or trailer when fully loaded for travel. This includes the unloaded vehicle weight, all fluids, cargo, optional equipment and accessories. The tow vehicle and trailer each have a GVWR, and their combined weight should be less than the tow-vehicle’s Gross Combined Weight Rating (GCWR). If your RV has multiple axles, it will also have a Gross Axle Weight Rating (GAWR). The GAWR is the maximum distributed weight that may be supported by an axle of a road vehicle. If you’re like most campers, your gear tends to grow as your camping needs and family grows, making your lightweight RV significantly heavier. If the RV you choose – or your towing vehicle – isn’t going to accommodate those needs, consider upgrading. Question #2: What kind of insulation does the RV have? Lightweight RVs are designed to keep their weight to a minimum, so it shouldn’t come as a surprise that lightweight RVs tend to have less insulating materials than traditional RVs. Moderate temperatures are never guaranteed– as most campers know – so ask about the RV’s insulation or R-Value. The higher the R-Value, the better it’s insulated. To find visible evidence of good insulation, look for a sealed underbelly, finished storage compartments, and the use of thermal foil beneath the carpet in slideouts. If you’re shopping at a dealership or attending an RV show, request a breakaway view of the model. Several manufacturers show these in their brochures and other promotional material. Question#3:How will I level the RV? Leveling your RV may not seem important, but if you’ve ever camped on a slope or uneven ground, you know how uncomfortable and awkward it can be. Not only that, leveling your RV makes certain features operate better. Slideouts will slide out much more easily if the RV is level, of course. But your refrigerator will actually work better if your RV is level – they tend not to cool properly when they’re on a slant. Want to learn more about lightweight RVs? Download our free e-book: A Beginner’s Guide to Lightweight RVs.